Four days later, same area, slightly different angle and light. Stock tank plant display area at the Lady Bird Johnson Wildflower Center. 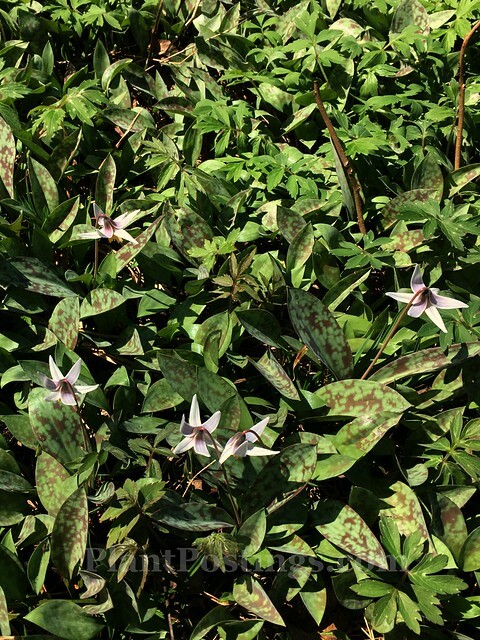 At the Austin Garden Bloggers Fling last May, I learned that the soil in the Austin area varies widely, depending on the location of the garden. 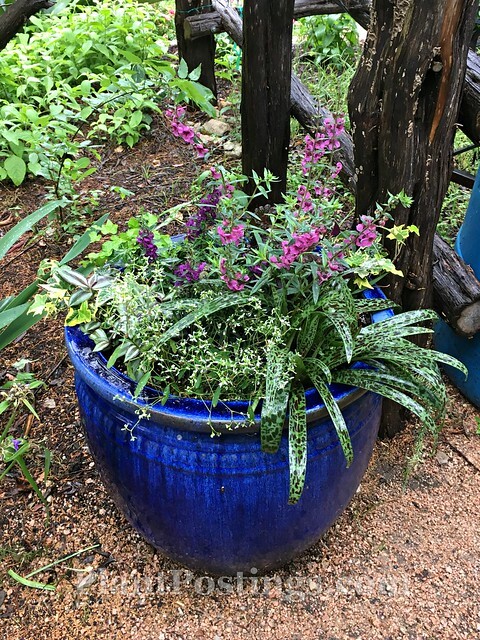 I also learned that Austin gardeners are incredibly creative with their container plantings--often dealing with soil challenges, but sometimes simply because they're talented folks. 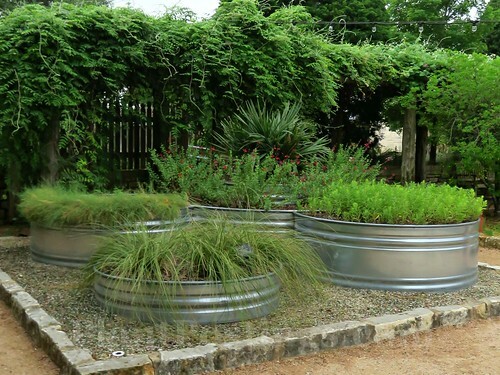 Stock tanks, like those used at the Lady Bird Johnson Wildflower Center to showcase native plant species, are a common vessel for plants in Austin. 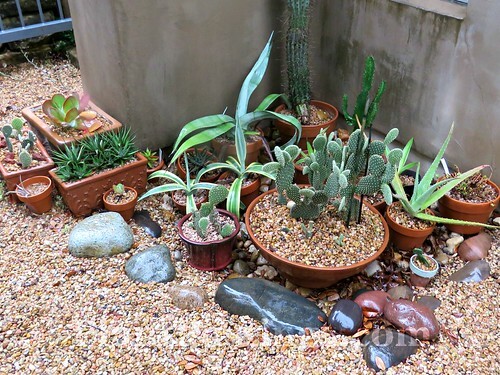 Terra cotta pots set on gravel and surrounded by beautiful rocks are a great way to showcase a little corner of Jennifer Stocker's (Rock Rose) impressive plant collection--in this case, a sampling of succulents. 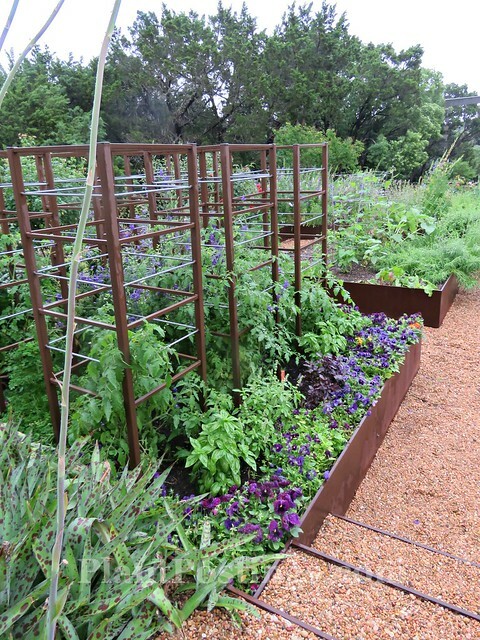 Metal planting beds edged along a stepped walkway with matching caging seem elegant, and blend well with the natural surroundings at this private garden. Designer Colleen Jamison's whimsy with pots and plantings includes this delightful stacked display leading up to the door. 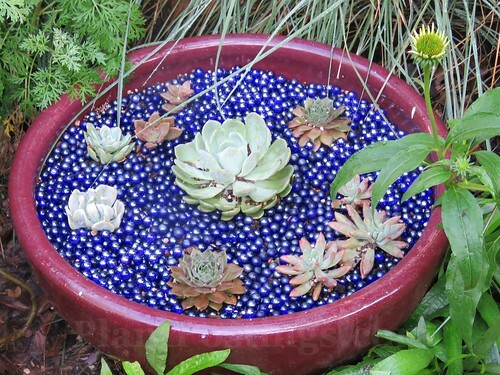 A colorful ceramic pot filled with blue marbles suggests water and floating succulents. 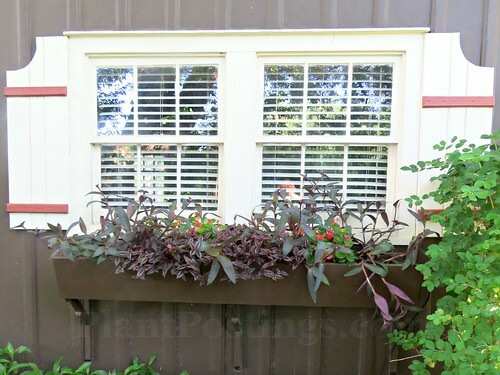 Creative window boxes always catch my eye, and the colors in this one are dramatic, but complementary to the structure's paint colors. 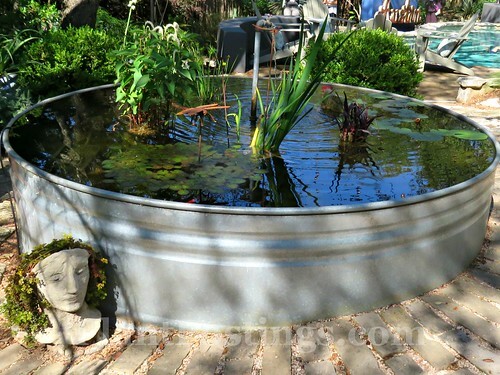 Pam Penick's (Digging) stock tank pond is really something special--it fits the surroundings, and the brick pavers framing it. 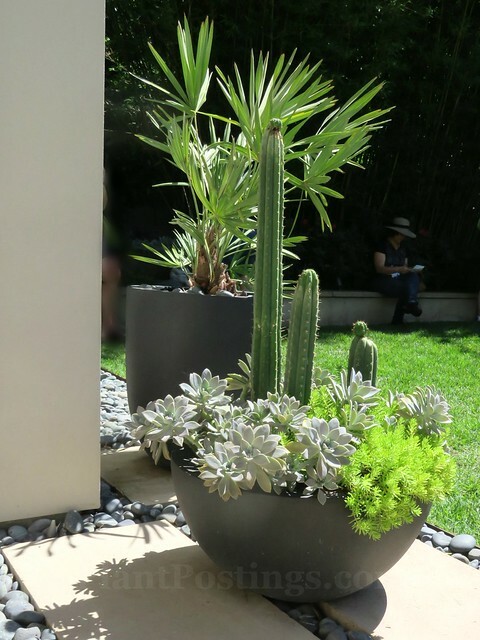 A totally different style and use of potted plants awaits at the garden of designer B. Jane. 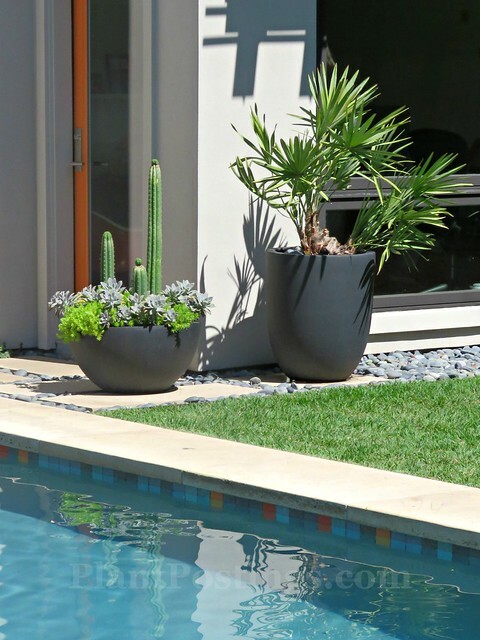 The collections are expertly arranged around the foundations of the buildings and the pool. 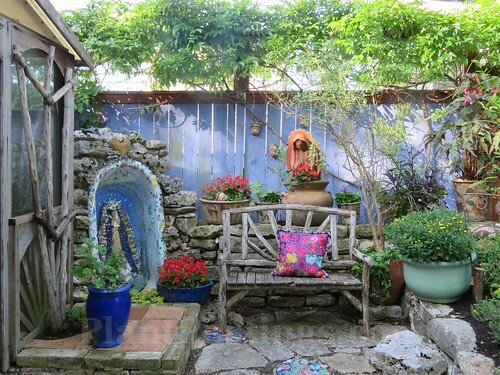 Traditional designs are wonderful, too, like this one at a private garden. 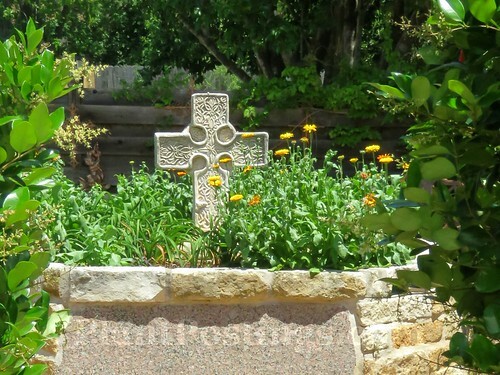 I love the look of this old-fashioned well-surround, planted with Daylilies, Daisies, and other plants, along with the Celtic cross. 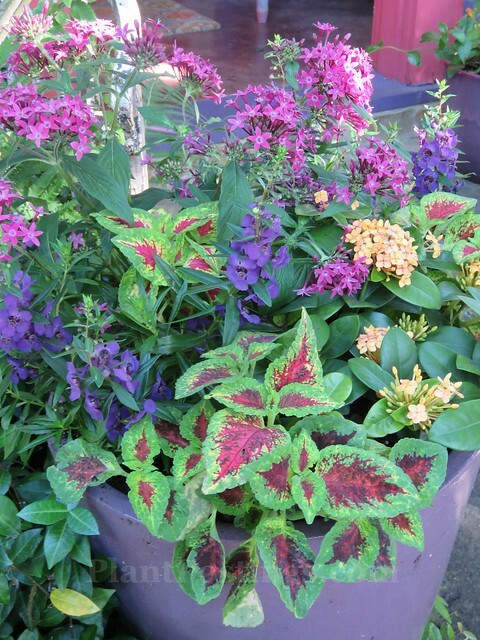 Author/designer Lucinda Hutson certainly works magic with her colorful planters. I love the bright colors of this pair. 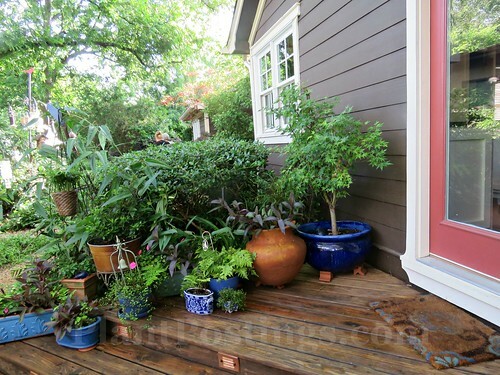 This little courtyard on her amazing property is filled with potted fun. Her unique use of pastel beauty really makes a statement. 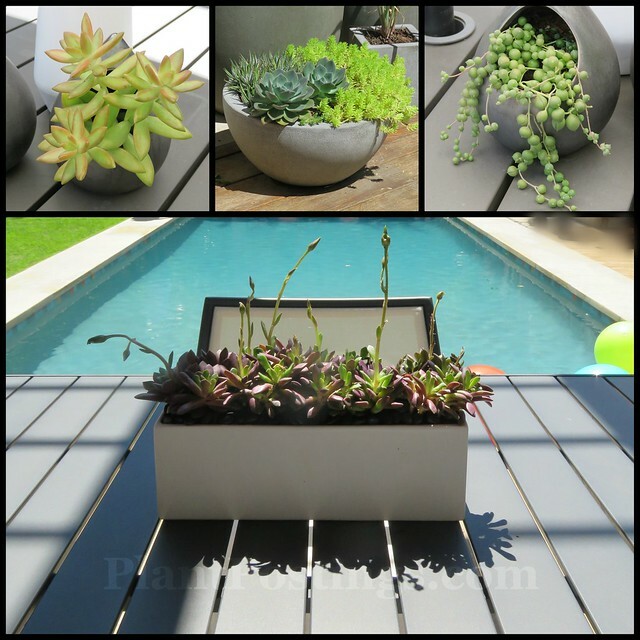 Another private garden makes a nice use of echoing potted succulents on the table with a complementary arrangement on the patio. 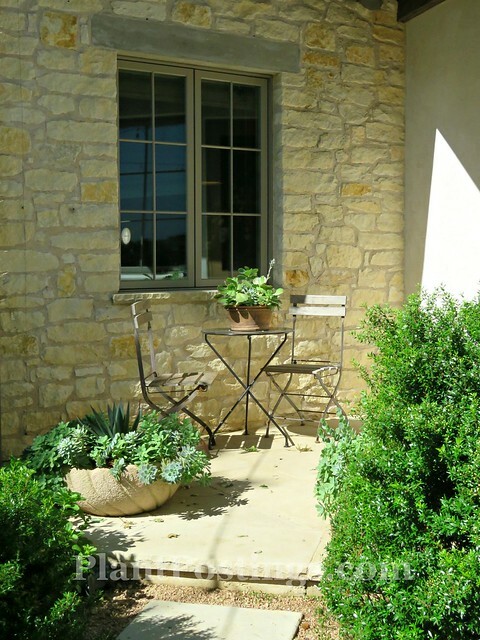 The warm earth-tone colors of the pots set off the beautiful limestone brick. 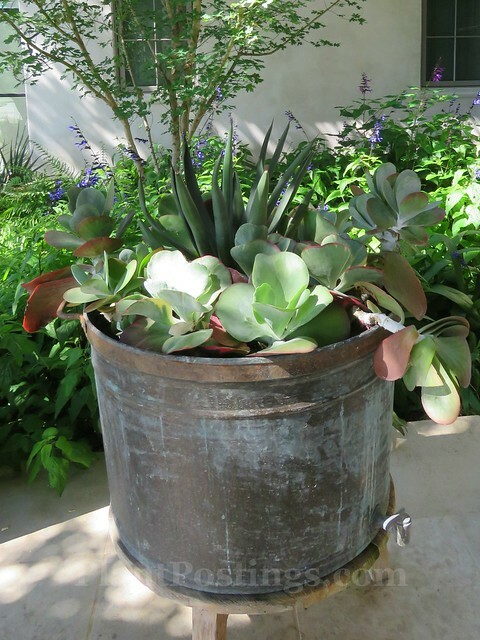 Succulents spilling over the edge of a metal pot, framed by Salvias in the courtyard--very nice. 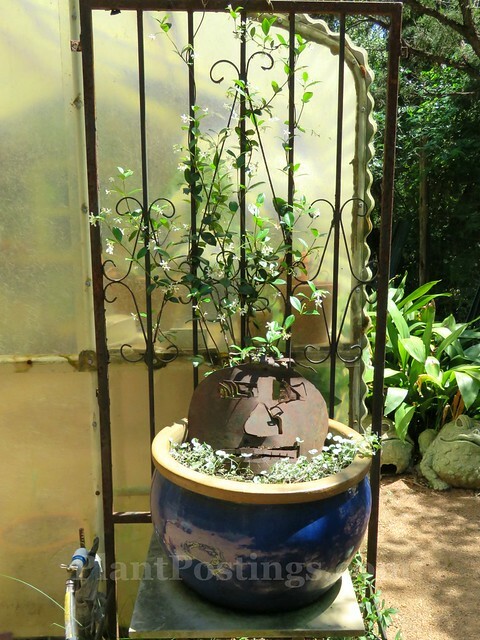 Talk about creative--I love everything about this grouping--from the face sculpture to the metal door/trellis to the bright blue pot. 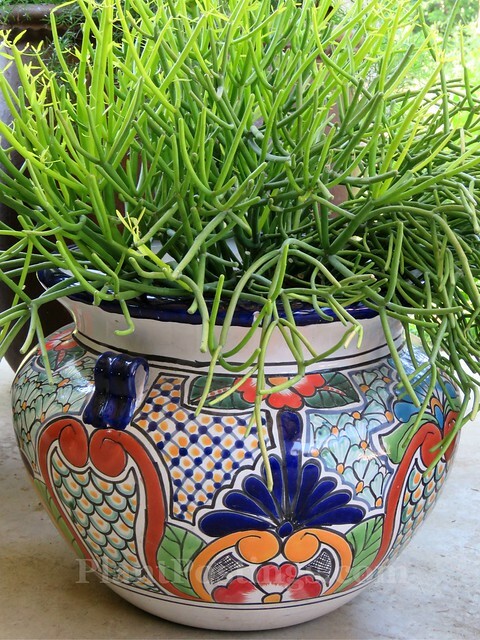 Sometimes pots are so vibrant, the best plants for them are angular and green, like this Pencil Cactus Euphorbia. 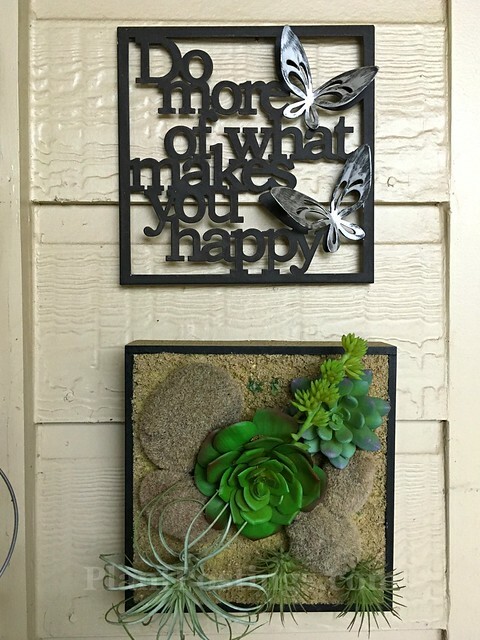 Designer Diana Kirby has some unique planters, too, like this vertical planter with succulents, reminding us of the important things in life. 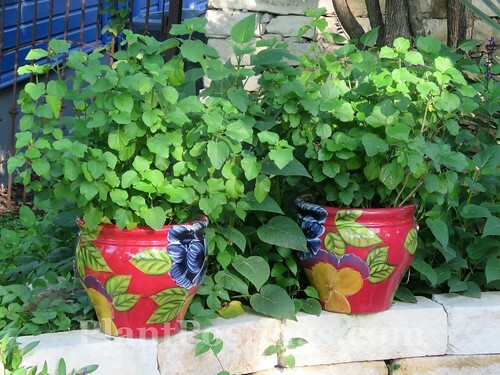 This vibrant blue pot with a tasteful collection of plants spilling out all sides is simply lovely. The Garden Bloggers Fling is always inspirational and fun. This year we're meeting in Denver, Colorado, June 13-16. To learn more about The Fling visit this link: https://bit.ly/2I7l5ao. At the beginning of November, I started a #shortdayschallenge on Instagram. The purpose: to increase my appreciation of the blessings of each day--even through the coldest, shortest days. 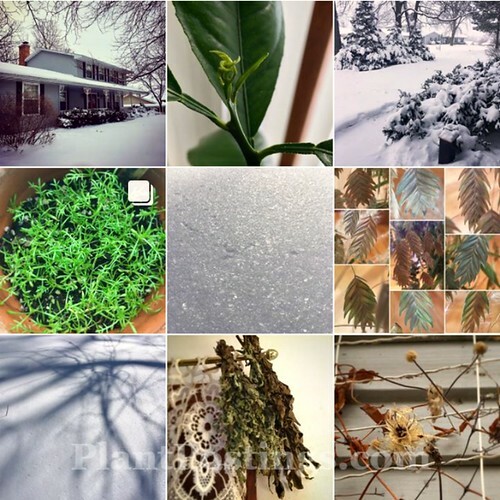 I wanted to avoid my common habit of wishing the winter away, which can mean missing out on little pleasures and living in a sour state of mind for weeks on end. Did it work? 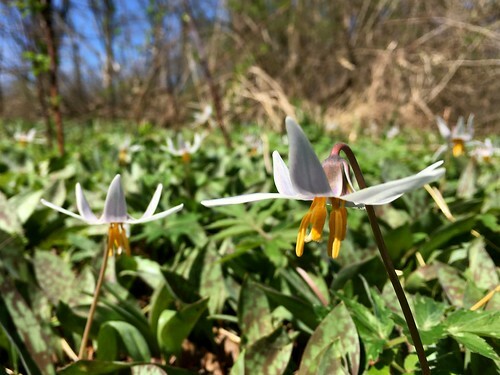 For the most part, I would say yes, posting about a special thing each day helped me better appreciate the season. 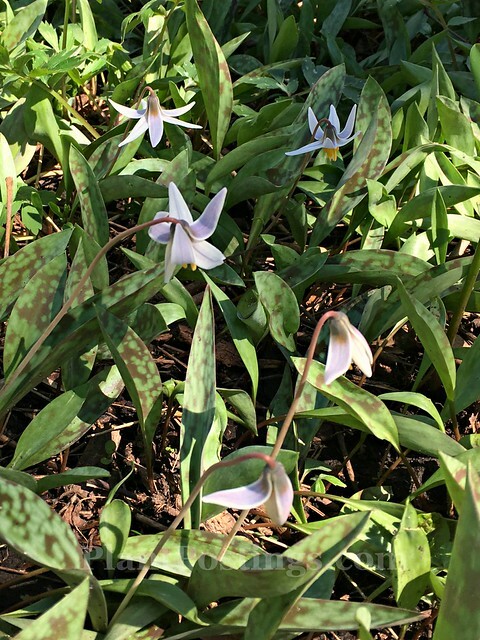 Admittedly, this particular winter with its deep polar vortex and erratic temperature and weather changes has been tough. But the #shortdayschallenge did help. bit--not an official break, but a slowdown. I have some good reasons. 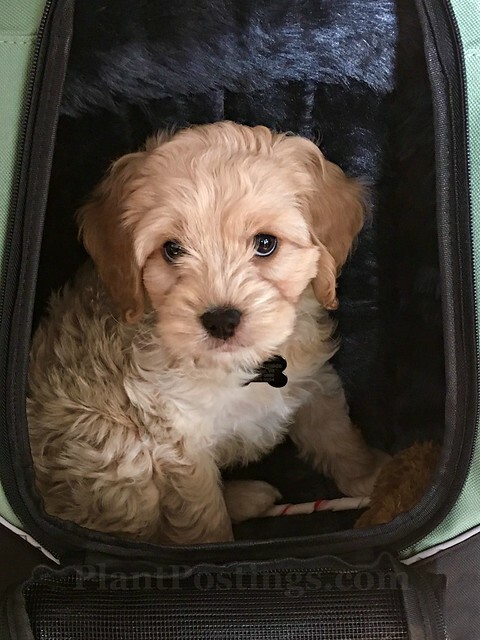 One reason is this little fellow--our new little cockapoo puppy, Nicholas. He's really smart and he's catching on quickly to all things puppies need to learn. I'm trying to savor the time with him as a puppy. It will pass too fast. 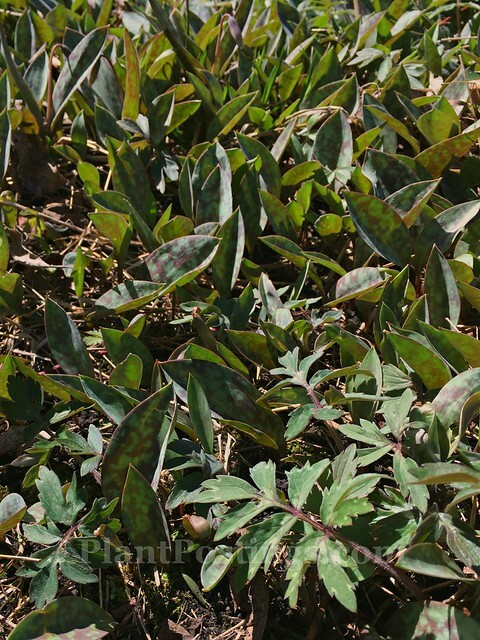 Also, I need to get going with some seed-starting! 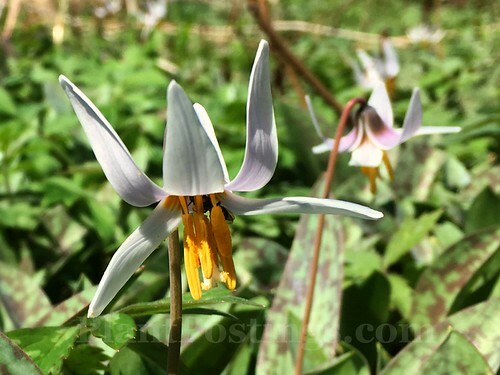 Spring will be here before we know it, and I hope to have some healthy starts to plants for the potager garden. Other family events are keeping me busy, too. So, I apologize for not being as attentive with visits and comments on your posts for a few weeks. 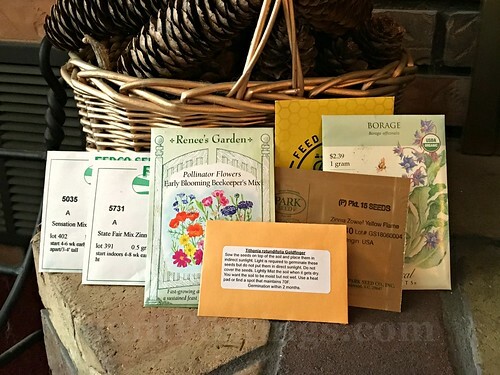 Time to prepare for the growing season ahead!